All existing Central Excise, Service Tax assessees and VAT dealers have to migrate to GST. To migrate to GST, assessees would be provided a Provisional ID and Password by the CBEC/State Commercial Tax Departments. 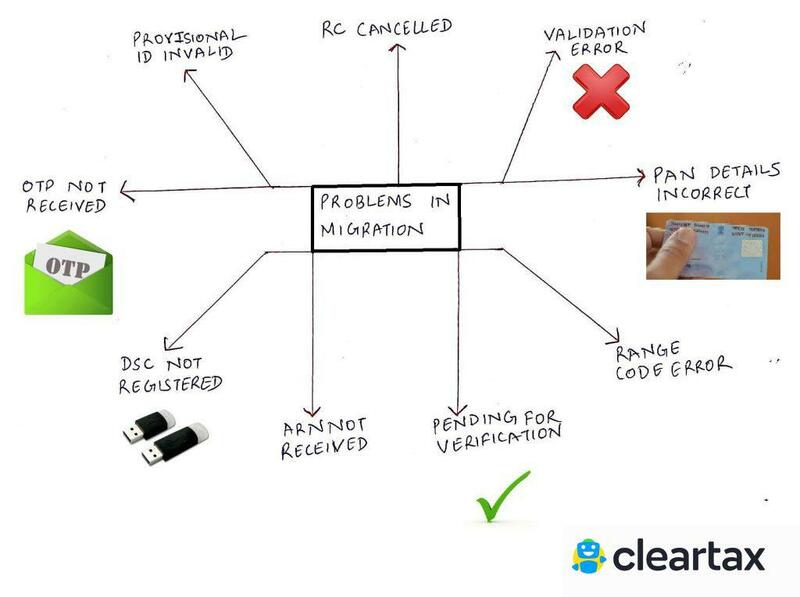 However, there are a number of problems that businesses face during migration. Try deleting the browsing history and signing in on the GST portal again. You will receive a 10-digit access token along with a provisional ID. If your access token is less than 10 digits (eg. 7654356), insert a zero, in the beginning, to make it a 10 digit access token (eg. 0007654356). Error message: “Your RC under is cancelled, therefore Provisional ID stands cancelled. Hence you are not to migrate under GST”. Resolution: You might not have filed your returns (ST/VAT) within the due date. Hence the ST/VAT department would not have forwarded the GST provisional ID to the GST department. You need to go to the department (ST/VAT) in person and ask them to push the provisional ID manually. You will get a validation error if you enter incorrect PAN details. Entering the correct PAN details of the directors is very important. This is specifically applicable in the case of the full name of the directors being entered on the GST portal. When you enter the First, Middle and Last Name, it is necessary to update the same as specified in the PAN database (with the income tax authorities). You need to select the correct range code while filling in the GST Form-20 on the GST Common Portal. It may happen that the required range code is not appearing in the drop down. Try refreshing the page and check again to see if the range code required by you is appearing now. When you get a message saying “pending for verification” please check if you have provided the correct OTP. Also, check if your Adhaar is linked to a mobile number. ARN for all the migrations will be received after 15th June 2017. If you do not receive the same after 15th June, get in touch with the GST Helpdesk. If you face any of the above problems in GST migration and the resolutions stated above are not working for you, please get in touch with GST Helpdesk at helpdesk@gst.gov.in or call at 0124-4688999.